Litter Prevention Contest Deadline Extended! The Alice Ferguson Foundation has announced that the deadline for their Litter Prevention Video Contest has been extended to June 15th. If you’re interested in testing your marketing skills and showing your support for clean land, safe water, and healthy lives in your community, don’t delay! Entrants are competing for a chance to win $1,000 and have their video used as a PSA for the Regional Litter Prevention Campaign. For contest and entry details, please visit the Alice Ferguson Foundation. First spotted in Michigan in 2002, the Asian emerald ash borer poses a serious threat to native ash trees and the people that live near them. The invasive insect feeds solely on the inner bark of all 22 species of native ash tree and has destroyed more than 100 million trees in 15 states – including Maryland and Virginia. Urban areas with fewer species diversity are at particular risk; Baltimore, for example, has a tree canopy comprised primarily of ash trees and could see major losses if the emerald borers establish a foothold within the city. Studies of the insect have shown a correlation between tree death and human mortality rates. A recent study showed an increase of deaths from cardiovascular and lower respiratory illness that coincided with the decreasing population of ash trees. While the study’s authors refrained from any direct cause-and-effect relationships, they did cite previous studies that demonstrated health benefits of trees, including improved air quality and temperature moderation. Preventive measures against the insects are mostly comprised of targeted pesticide usage. However, some biological control measures, such as introduced parasitic wasps, have been successful. In Michigan, where the wasps have been widely established, emerald ash borer populations have been reduced by one-third. People who spot emerald ash borers are encouraged to report the sighting. In Maryland, call 410-841-5920; in the District, dial 301-313-9327. For more information on the emerald ash borers, please read the full Washington Post article in Urban Jungle. Join us for casual conversation and social networking. This month’s highlights include a presentation by Mike Hunninghake of MD Smart Energy Communities, a meet-and-greet with members of the Bethesda Green Business Incubator, and information on ways to make a difference in your community. Discount drink prices and complimentary appetizers courtesy of Ri-Ra. For more information, and to RSVP, please visit the Bethesda Green Meetup. Do you want to certify your business or organization as “green” but don’t know where to start? GreenWheaton and Silver Spring Green are proud to present this FREE Green Business Certification Workshop to help community members learn more. Offices, congregations, faith-based organizations, retail stores, and landscape companies are all eligible for County certification as a green business/organization. Featured speakers will include Doug Weisburger of the Department of Environmental Protection, Dave Taghipour of All Eco Center, Jon Widrick of Acensus Law, and Gary Skulnik of Clean Currents. Join GreenWheaton and the other community Greens for Green Drinks with others who want to thrive in environmentally sustainable communities. Eat, drink, and be Green! Join the Sustainable Energy Coalition for this expo that will bring together businesses, sustainable energy trade associations, government agencies, and energy policy research organizations to showcase the status and near-term potential of the cross-section of renewable energy. This free event will discuss the role sustainable energy technologies can play in meeting America’s energy needs, as well as issues of national security, high energy costs, and more. To learn more about the event, please visit the Environmental and Energy Study Institute. On Friday April 26, I was excited to represent Bethesda Green at the Francis Scott Key Middle School’s 6th Annual Green Day. 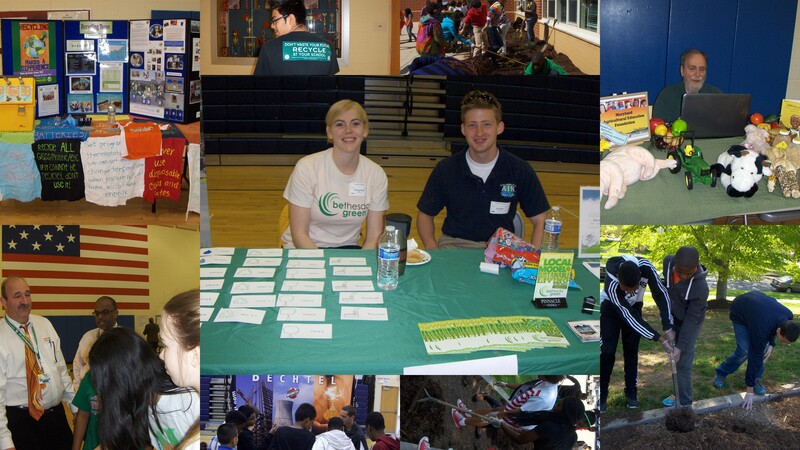 As the culmination of their Earth Month activities, the school invited representatives from environmental organizations around the Maryland & DC area, including the U.S. National Park Service, the Maryland Agricultural Education Foundation, Locust Grove Nature Center, the Department of Natural Resources, and more, to staff tables and discuss their environmental and sustainability efforts. Treva Coates, coordinator of the IB Middle Years Programme, explained that while Green Day is an annual event, the school’s environmental and sustainability efforts continue year round. Francis Scott Key is an excellent example of a green school. Several years ago, the old building was torn down and a modern up-to-date building was constructed in its place. However, rather than generate tons of construction waste, Francis Scott Key was re-built using 95% of the materials from the old building. Additionally, the new building is equipped with solar panels, and the back field has geothermal tanks installed beneath to assist with the temperature management of their water. These accomplishments are some of the reasons that Francis Scott Key Middle School is a LEED Gold School and the first school in Montgomery County to be designated a U.S. Department of Education Green Ribbon School. The staff at Francis Scott Key are passionate about getting the students involved in environmental stewardship. They have eliminated the use of Styrofoam trays in the cafeteria, and taught the students to separate trash, paper, and plastic after they’ve finished eating. As I walked through the building on Green Day, I noticed the presence of paper and plastic recycling bins in every hallway and room. To make sure that the student population works with the program, the school has formed a student-led School Energy and Recycling Team that monitors the proper use of the recycling and trash containers in each classroom. Besides the SERT team, there is also the School Beautification Group; students rotate into the group every four weeks learning about ways to be green and sustainable and participate in the monitoring of the recycling program. Finally, a staff member sponsored the Green Crafts club, in which she teaches students how to design and make crafts and jewelry from recyclable materials such as plastic bags. Throughout the day, students were sent into the activities hall in groups and walked around to inspect the tables and learn about the various organizations. The Maryland Agricultural Education Foundation presented students with dwarf sunflower seeds and growing pods; the Locust Grove Nature Center showcased shells and exoskeletons of species native to Maryland; Montgomery County School Energy & Recycling Team discussed the waste cycle and demonstrated the differences between incandescent, compact fluorescent, and LED lightbulbs; A.I.R. Lawn Care displayed its solar-powered trailer and equipment and talked about the importance of green landscaping. Watching the kids’ reactions as they learned more about the green movement was a great experience. Some kids really seemed to be inspired by what they saw, and I’m sure that Francis Scott Key will see a spike in its SERT team and School Beautification Group. A school that’s already taken such great steps toward sustainability is sure to go further in that direction, and the newly inspired students will certainly help lead them down the path. Images courtesy of Treva Coates. Are you interested in greening your home? Do you want to save money and create a healthier environment for your family? If so, plan now to attend Bethesda Green’s 4th annual Solar & Green Home Expo, Saturday, May 11, 10 am – 3 pm. The event will be held at the Bethesda Green offices, 4825 Cordell Avenue, 2nd floor above the Capital One Bank. All are invited to attend this FREE community event, explore and participate in workshops, and discuss practical ways to green your home. Representatives from the Montgomery Department of Environmental Protection Energy and Pepco will answer questions about costs, benefits, tax credits, and other incentives. Learn about the advantages of going solar in your home! Local green businesses will showcase products and services that can help homeowners go green. Participating companies and organizations include: Solar Energy World, Standard Solar, ecobeco, Growing SOUL, Savenia Labs, A.I.R. Lawn Care, Bethesda Systems, Energy Squad. Click here to see a complete list. Learn more about the Solar & Green Home Expo and see a detailed program schedule here. Snakeheads, the invasive species that’s been the bane of the Potomac since 2004, have been granted a mild reprieve by local governmental agencies. While the U.S. Fish & Wildlife Service still recommends that fisherman kill and report any snakeheads they capture, the Virginia Department of Game and Fisheries, along with its DC and Maryland counterparts, has begun a new monitoring program geared toward understanding the snakeheads’ impact on local ecology. The program, which covers four tributaries of the Potomac, sends out workers to capture, measure, tag, and release snakehead fish. John Odenkirk, biologist with the VA Dept. of Game & Fisheries, says that its been hard to determine whether the snakeheads actually have a negative impact on the Potomac watershed. He points out that the area is practically a fish factory, and has more than enough resources to feed the increasing number of new mouths. So while he does not advocate for the snakeheads, he finds it hard to strongly advocate against them without more conclusive data. That’s where the monitoring program comes in. Because the snakeheads are native to Africa and Asia, many of the scholarly papers discussing their behaviors and life cycle are not written in English. Those few that have been translated are not peer-reviewed. Thus, there is little to no substantiated information about their impact on local water systems and ecological niches. The monitoring program relies on electrofishing to capture the snakeheads. This form of fishing involves electrified anodes whose currents shock, but do not kill, nearby fish, causing them to float to the surface and be easily netted. Typical of the snakeheads’ difficult nature, these fish do not succumb easily to the shock. Rather than float to the surface, snakeheads expel all the oxygen from their air bladders. While this gives off a tell-tale series of bubbles, the expulsion causes them to lose their buoyancy and sink to the bottom of the stream bed. Odenkirk says that this behavior means that he and members of the program have one shot to catch the fish before they’re no longer within reach. Once the fish are captured, they are measured, tagged, and released. If the team catches a fish that has been previously captured, they record its growth. Odenkirk says that the team is gathering as much data as they can on the life cycle of the fish, including spawning cycles, spawns per year, average growth per year, and habitat differentiation between adolescent and adult snakeheads. The more information that Odenkirk and his team can gather, the better we will be able to understand the impact of this invasive species. For more information on the snakehead monitoring program, please watch the video at The Washington Post. Though its been six months since the superstorm touched ground and devastated New Jersey and New York, Hurricane Sandy’s impacts are still being felt up and down the East Coast. A report released last week revealed that one of the major effects was the spillage of 11 billion gallons of sewage from East Coast treatment plants into streams, canals, and roadways. 90 percent of the spills occurred in New Jersey and New York, the states that were arguably hit hardest by the hurricane. Of the sewage, approximately 3.5 billion gallons was raw, untreated, and unfiltered. The remaining 7.5 billion gallons were partially treated. Alysosn Kenward, researcher at Climate Central and author of the recently released report, states that the report has revealed “just how vulnerable the system is to floods, storms, and climate change,” and points out that, “our system isn’t designed to handle these kinds of storm surges and the sea-level rise associated with climate change.” According to Climate Central, the state of New York will need to spend about $2 billion to repair damages to the sewage treatment plants, while New Jersey plans to allocate $1 billion for repairs. For more information, please read the full article on The Huffington Post. A team of volunteers, EOM supports all of Bethesda Green’s communication efforts. From recycling to energy efficiency, sustainability to green building/design, EOM expresses the organization’s various areas of expertise in a clear and concise manner via various media. New members are welcome to join; for information contact Bethesda Green’s Director of Communications Dave Heffernan at dvheffernan@bethesdagreen.org. Join us for our 4th annual Solar & Green Home Expo, an information-packed showcase event featuring many green home expert services and solar providers. The goal of this event is to provide homeowners and other interested parties an opportunity to get the latest information about area services and incentives to green their homes. Local area green home businesses will display their services throughout the Bethesda Green office space while individual workshops related to greening your home will be conducted throughout the day. To learn more about his free community event, please visit the event page here. Get your wheels turning at the 2013 Bike to Work Day! Presented by Bethesda Commuter Solutions, the Bethesda pit stop will feature DJ entertainment, state and local dignitaries, tons of raffle prizes and giveaways, bike maintenance checks, and plenty of food and drink to fuel your commute. The grand prize in the raffle will be a brand new bike from Griffin Cycle! To learn more about the event and to register, please visit Bethesda Transportation Solutions. Bethesda Green is excited to present the Investor Pitch Training Program for entrepreneurs in the green sector. This event is the culmination of our six-month finance workshop series and will put highly qualified entrepreneurs in front of active investors to receive sophisticated feedback on their readiness to seek investment. Approximately six tech and non-tech early-stage businesses based in Maryland, DC and Virginia will be selected to present. The companies applying should have sustainable products or services and a growth-oriented business model. The Investor Pitch Training Program is ideal preparation for those getting ready to seek financing or for participation in accelerator programs such as CleanTech Open. The selection process for participating companies will be based on feasibility, scalability, business model and sustainable criteria. The application requirements are as follows: A one page “teaser” company profile; a 3-5 page executive summary including product/service description, competitive advantage, market, revenue generation, team and sustainability; financials; a pitch presentation of up to 10 slides. Because sustainability is a key component of our judging criteria, please be sure to describe the net positive environmental and social impact of your product or service. This program is an excellent opportunity for entrepreneurs looking to perfect their pitch through experience and expert feedback. Bethesda Green’s objective with this and our Finance Workshop series has been to promote the growth of the green industry sector in the region. Robert Snyder, Bethesda Green’s Incubator Manager, points out that a major part of that growth is preparing entrepreneurs to successfully access financing. Don’t miss out on this great opportunity — submit today! THE DEADLINE FOR SUBMITTING APPLICATIONS IS MAY 17. For more information on applying, including application materials, visit the Bethesda Green website. For questions, email Robert Snyder, Bethesda Green’s Incubator Manager, at rsnyder@bethesdagreen.org. Rochel Roland is firm in her belief that taking a bath is one of the best ways to relax your body and mind. The founder of Joyful Bath Co. has had a life-long love affair with hot baths but was always disappointed by the bath products available. Some had too much fragrance, others left an oily residue, and all were filled with unnatural chemicals. Rochel began creating her own formulations mixing organic salts, pure essential oils and healing food-grade ingredients, unlike any other bath products on the market. That’s when she realized she’d found her niche, and Joyful Bath Co. was born. Starting out small, Rochel sold her products at schools, churches, fundraising events, and military facilities all over the area. She was able to interact directly with customers, get immediate feedback and realize the extent of the customer demand for her products. During that time, she also established her supply chain and prepared for growth. In 2010, Rochel exhibited at the natural products industry’s national trade show and began receiving her first large retail orders. Rochel cares about more than a good bathing experience – sustainability is a big focus at Joyful Bath Co. Rochel selected her manufacturers based on their concern for quality and sustainable sourcing. She strives to balance environmental concerns with product freshness, and deliberately uses glass jars as packaging to encourage recycling and re-purposing. Whenever possible, Rochel uses recycled paper and paper products. The all-natural ingredients that go into all Joyful Bath Co. products are truly 100% natural. Rochel believes that cutting corners doesn’t work if it means acting in a way that harms the environment. Rochel is also concerned about saving water – Joyful Bath Co. gives their customers instructions on how to take a “Power Bath” that provides all the wellness benefits of taking a bath without using any more water than a shower. Joyful Bath Co. soaps are all biodegradable. Rochel and Joyful Bath Co. joined the Bethesda Green Incubator in October 2012. Since then, Rochel has made business connections through the Incubator and had access to educational resources that have helped her expand Joyful Bath Co. The monthly Incubator meetings allow her to share experiences and tools with the other Incubator companies, and the lunch talks have featured speakers well-versed in starting small, sustainable businesses. 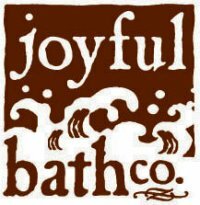 Joyful Bath Co. products are available at Whole Foods Market, Dawson’s Market, and online at joyfulbathco.com. For bath lovers, Rochel recommends the Bath Variety Six Pack that includes one each of the six signature salts. Soap lovers can try out a variety of soaps by purchasing the travel/trial size bars, available in all six scents.